Performance sedan enthusiasts are treated to an all-new car from Jaguar this year: the spectacular 2017 Jaguar XE. First of a new generation, the Jaguar XE is built to exceed all expectations of a compact luxury sedan. With its robust engine options, lightweight platform, smooth ride, superb handling and an abundance of high-tech features, the new XE delivers an immensely enjoyable driving experience. One of the major competitors of the Jaguar XE is expected to the Mercedes-Benz C-Class. Take a look at this 2017 Jaguar XE vs 2017 Mercedes-Benz C-Class comparison to see how these high-performance compact luxury cars stack up. In terms of price, the Jaguar XE offers a considerably more affordable option, with a base MSRP of $34,900, which is $7,750 cheaper than the base MSRP of $42,650 for the Mercedes-Benz C-Class. Despite the lower starting price, the new XE delivers the pinnacle of automotive luxury and sophistication. Exquisite materials and finishes combined with Jaguar craftsmanship give it a class-beating interior that’s unlike anything else in the segment. Jaguar’s new InControl Touch infotainment system takes center stage: its innovative 8-inch touchscreen brings fast, intuitive access to all features and functions – and iOS and Android smartphone apps. When you add in the XE's exceptional performance, premium style features both inside and out and groundbreaking safety and driver assistance features, luxury car shoppers get incredible value with this exceptional new sports sedan. As can be excepted from Jaguar, an automaker that boasts decades of producing vehicles with top-level performance, the all-new XE is a thrilling car to drive. The 2017 XE delivers impressive power by a range of highly-advanced gasoline and diesel engines. The supercharged 3.0-liter V6 engine puts out an outstanding 340 horsepower and 332 lb-ft of torque, while the turbocharged 2.0-liter 4-cylinder produces 240 horsepower. In comparison, the 2017 C-Class only offers one choice: a 241-hp 2.0-liter 4 cylinder engine. Also if you prioritize efficiency, the 2017 XE's 2.0-liter four-cylinder turbodiesel engine gets a fuel economy of 37 mpg combined. Additionally, performance is further enhanced in the 2017 XE with its superior driving dynamics, lightweight aluminum structure and advanced double wishbone front suspension. The Jaguar XE comes with a wealth of new technology, especially with innovative driver assistance features that will make your ride more enjoyable, convenient and safe. Adaptive Cruise Control uses radar technology to automatically adjust your speed to match the vehicle ahead, while the Blind Spot Monitor uses radar sensors to cover areas difficult to see when you’re driving. Also, the XE's Traffic Sign Recognition technology uses a forward-facing camera to detect speed limit and no passing signs, and then displays them to the driver on the instrument panel. 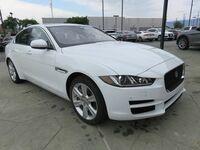 If you're a luxury car shopper in San Antonio, New Braunfels, Boerne, Schertz or anywhere else in Bexar County TX and would like to take your driving experience to a more refined and sophisticated level, then we highly recommend you contact us at Barrett Jaguar and check out the spectacular 2017 Jaguar XE.